Hotel Overview Location: Elenite Holiday Village is the only Bulgarian sea resort that is fully south-oriented, thus providing plenty of sunshine to its guests. The gently sloping hills nearby keep the air fresh even in hottest summer days. The luxury Villas, spread like a mosaic over the hills, the touch between the sea and the mountain, all this creates a fascinating experience. The architectural solution implies privacy and comfort. Accommodation: Holiday Village Elenite offers to its valuable guests: 212 two-story villas (424 rooms) 35 three-story villas (105 rooms). All rooms have terrace, telephone, SAT TV, mini bar, bathroom with hairdryer, air conditioning. The family suites have a bathtub as well. All of the villas are sea-view. Facilities Hotel and room facilities of Elenite Holiday Village - point the mouse over an image to see the meaning. The guest can enjoy the cozy atmosphere of the Lobby Bar, a place to relax and meet new friends. One can have a refreshing drink from the Pool Bar while enjoying the sun and the water. A team of 13 professional animators works in Elenite Holiday Village. In the evening (starting at 21:00 PM) the guest can enjoy various stage shows. There is a discotheque for children (8:00 PM) as well as kids shows. Also there is a Night Club. There is free guarded parking lot, medical service 24 hours a day, kindergarten - professional child care, outdoor swimming pool, shopping outlets, currency exchange and internet club. 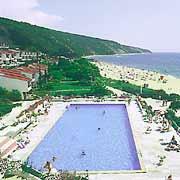 Hotel Address Elenite Holiday Village is located in Elenite, Bulgaria. I am trying to contact Elenite holiday village as we are staying there on Monday and i would like to arrange a birthday suprise for my partner. Does anyone know the number or an email address? Hi , wonder if anyone can tell me how far the water park is from the holiday village. Also are the bungalows two storey per family. We just thinking about booking for next July !! The Water park is at the entrance to the holiday village and depending on were your room is no more than a 5-10 min walk. The bungelows are not 2 story to my knowledge but are larger rooms and can sleep a family of 4. Hope this helps. Hi we have booked to stay at the Royal Bay Hotel 13th June for 2 weeks. I have two questions that I would be grateful for any help on. We found the resort flat and has ramps but not the best layout due the the hotels being bulit on the side of a hill so make sure you fit if pushing a wheelshairs !!! there are a lot of steps upto the reception of the holiday village but ramps are in place around the resort but all up hill. 2. Can you use any of the hotels under the all inclusive. You can use all the bars in all the hotels but you must use you own hotels restaurant, there are various snack bars which are part of the all inclusive. Many thanks in advance for any advise you can give me. You are doing the right thing Chris, go with an open mind. Don't expect 5* 'cos it isn't, but it's great value for money. Try the Irish bar called Morris' which is under the Royal Park at the end of the shopping centre. We only discovered this time that it's part of the all inclusive and makes a change (Don't confuse it with the Frigate Irish bar 'cos that's not all inc)the air con is good in there and there are never queues as not many know it's all inc.
Not sure if anyone has seen this lots of information about the hotel all inclusive package. only 5 days to go, am going to go with a open mind and looking forward to going will post my review when i return. Just returned yesterday from Elenite for the 3rd time. It was better than ever. Myself and my wife and two kids found the food fine, if a little repetative but it was better than the previous two years we had been and we were with other families who had also visited before and also noted an improvement with the food. The entertainment was much better than last year and for value for money, facilities, cleanliness and sunshine this place in my opinion can't be beaten. I'll be happy to answer any questions anyone has. There is a kids club for the villas but it is mainly russian and german kids who go. My 6 year old daughter went to the t shirt making in the animation hall at £7 a t shirt. They told me to come back in an hour. I was shocked as after she had been there 35 mins they told her she had finished and to go and find her mother. She had walked from middle of the resort to end looking for me. In reply to Chris. I have just returned. Some people think its great others hated it. I suppose it down to personal experiance. I went for 2 weeks on 12/07/10. If you have kids in a buggy take the lightest pram you can. Pack plenty of snacks in case you dont like the food. Pack plenty of nappies and fly spray. The resort shop is really expensive and their is nothing outside the gates so you are stranded. We had no electric for 48hrs and food poisoning. Check the meat before you eat it. Pakkos is the only restaurant take a left outside the gates its about a 5min walk. A meal cost around 45 leves £23 for 5 with drinks. Dont have ice in drinks. Its not fantastic but better than the food in the resort hope this helps. I think a lot of people are complaining so hopefully it will improve by the time you get there. I am due to arrive on the 23rd aug for 14 nights with my family and friends then to be joined our 2nd week by more family and friends. Have read some really bad reviews latly on the hotel, such as undercooked food ? has any one just returned and come offer some advice ? WE ARE THINKING OF GOING TO ELENITE VILLA NEXT YEAR WITH OUR GRANDSON AGED 4YS IS THERE A KIDS CLUB HE CAN JOIN IF STAYING AT THE VILLAS. I KNOW THERE IS A KIDS CLUB IF YOU STAY AT THE ROYAL BAY HOTEL. IS THE FOOD GOOD AT THE VILLAS AS THERE ARE SOME FUSSY EATERS, AS WE ARE GOING WITH OTHER FAMILY MEMBERS. Thanks Elenite Lass, we are going Sat 31st, looking forward to it. Is the entertainment still in the big hall because on another website someone said it was being held outside? There was the odd night when it was held in the ampitheatre beside the Royal Park last year? The only thing that I felt let the holiday down last year from 2008 was the entertainment so I am pleased sone of the old entertainment staff are back. The water park at Elenite is good for everyone it costs 25 leva per day per adult and 5 leva per sunbed and 5 leva per parasol. You can opt for the All Inclusive pass whcih gives you access to the complex and entitles you to food and drink at the complex from 8am till midnight, food and drinks are payable in the water park even with the AI option. Yes the waterpark is open to the public but not sure how much it is. You can get on public transport from Sunny Beach. It's a good waterpark with plenty of slides for younger children and a big wave pool. It's got a pool bar, chaning rooms and a small shop selling snacks. When we were there last year they were putting finishing touches to what looked like a cafe which I think was accessible from the waterpark. Hope you have a greay holioday Christy. There are loads of things to do for your age group. The Aqua park is a must, it's free (other than the sunbeds and parasols) and has some great slides, i'm sure you'll spend hours there. There are also 3 other pools in the complex, 1 next to the coffee shop where you'll find the ice cream bar (loads of lovely flavours, not just the basic chocolate, strawberry and vanilla) along with snacks available throughout the day. There are pool tables and table tennis tables, internet cafe at the Royal Park Hotel (for MSN and facebook!) and a video games arcade. There are 2 other pools based at the Royal Bay and the Royal Park hotels. There is a great mini golf course and tennis courts. The beach is fantastic and there are watersports to do there, although only the pedalos are free. The entertainment team are fantastic (at least they were the last 2 years we have been) and they are on the go most of the day with loads of activities, I would recommend that you join in, you'l love it and they'll be your best friends by the end of the holiday! On a night there is a mini disco and most nights there is some sort of show in the entertainment hall. All in all it's a great place for kids, my 2 boys were 4 and 8 last year and are so excited to be going again this year. I'm sure you'll have a fantastic holiday. I'm not sure if the name of the waterpark, I think it is just classed as Elenite waterpark. It is included in the price of your Elenite holiday and is a good park, it never gets too busy. You do have to pay for beds and brollys but it's still worth it and to be honest sometimes it's worth just keeping your free bed around the other pool and taking a towel and spending an hour or so on the slides. All in all this is a brilliant holiday village. You will find the most complaints are about the food, but the quality is good and the food well cooked, but the Bulgarian's don't like their food as hot as us. The animation team work really hard and my kids loved them, on a night and in the kids clubs. The quality of the shows is not great for adults but again my kids thought they were fun and as long as they are happy us parents are too. This is our third year in a row at elenite in 2010 and I can't wait to get there. The value for money is excellent. Don't expect 5 * because it's not, but if you want a very safe, clean and fun filled family holiday, that's exactly what you'll get. Enjoy. This is the 3rd year we will be visiting the Elenite Villas having had brilliant holidays in 2008 and 2009. Can anyone who has just come back confirm that your band still gets drinks at all bars other than the Aqua park and how was the evening entertainment? That was the only (slight) dissapointment last year from the previous year when it had been great (although mainly for the kids)Also anything new for 2010? hi we came back on thursday & no they still had no ATM, they will change cash in recption though at a good rate. i have just come back from villas Elenite which is a brilliant resort. The villas are very clean and you get fresh towels everyday. The food is not great but is still edible. The only food that changes is the food at the far end. The pool is very clean but very cold evan though in the sun. The animation team is fantastic they entertain you at night and in the day playing lots of fun activates. At night people play football on the beach. The beach is very warm most days but can be choppy at night. the excursions are brilliant. We did three, the Off Road Adveture is one of the best. You fly off the seat in the jeep most the time. The other two were good but not brilliant. I would recommend two things that you do not do the Blue Moutain trip because you need to pay for the cable car ride which you have to do which is extra 5 lev for children and 10 lev for adults. I would not recommend this resort if you have small children in prams or walking difficulties as there are millions of steps to get to the beach the water park and more. hi all just got back from elenite stayed in villas had a great time, 16 of us went altogether ranging in age from 60's to 6 months had a great time, villas were always clean any problems were dealt with immediately by reception staff. although loads of steps to villas did manage to fine ramps at either end of complex although a bit further to walk with buggy was much easier than steps. Kids had a great time although ours are only 5, and 2 not a lot to do in the evening if children older. Entertainment team very good during the day our little ones are still shouting yellow team all the time as they orgainse an olympics day and everyone gets into teams and play lots of game great fun, although this is only once every two weeks. Food not excellent but edible, always found something to eat. We did book into the a la carte restaurants where you can go to each one once a week although you do have to queue fom 9.30 - 10.00 to book these it is worth it. Rooms are cleaned every day, and clean towels given. Although everywhere does close at midnight apart from the nightclub and the irish bar where you have to pay, we were normally too tired by this time to worry about it as we were so busy during the day. although the drinks and ice creams are very expensive priced at about 2 lev but stickers over real price inflating price to 8 or 9 lev most people refused to pay this. All i can say is overall we had a great holiday and would go back again but it is mainly for families would not really recommend it for singles or couples. hi could someone let me know are there any toys to play with in the pool like floats or water guns ETC. What type of soft drinks are there for the kids. IS it coke fanta or pepsi? if not are they still nice. is there lots of slides in the water park? Could you let me know what they serve the drinks in please. Are they in plastic cups or pint glasses?. Is there lots of places to eat and drink in with out having to pay. Can u get nice kebabs from a resturant on site. What are the three alcarte resturants like and again what food do they each serve. i have just come bach from villas elenite it was brilliant everyone enjoyed it. do not read or trust the bad reviews u hear. the water park it not that far from the villas and is brilliant!!!!! could the kids join in the shows at night. did they have games during the day for kids and adults. was the drink in plastic small cups or glasses and were they half or full pints. We have just come back from the Eletine Villas a week now and looking to book for next year so can any one that is going there soon can they get me a number for to book the villas. Please do not listen to the emails about not to go. but the Entertainment was not that good for any kids over 15 and adults but we made our own so do not be put of about going and the food in the villas was good and the villas or not that off a walk to the water park. Would say if the befare the beach to the pool then you would love it as hate the beach but my family love it so i was never of it would now say that i will back on the beach when we book for next year at Elentie Villas . Sunny Beach is a most if your kids like g.star etc as they or very good copies and cheap and you can bargain the price down . Do not change any money other than the hotel or the crown in sunny beach or eat the fruit from any one in sunny beach as they will then want you to buy from them and will not leave you alone if you eat the fruit. hi all i cant believe some of these reveiws. i know everyone has diffrent tasts but the holiday village was not that bad. you have to make the most of your holiday and thats what we did. their is lots to do including the water park and bowling, you have to pay for bowling but its not that dear . my kids loved it. the food was not that great but always found something to eat and mostly all the food we ate was warm and freshly cooked. the room was a bit dated but spotless the maids came in everyday and changed the towels & washed the floors. we had a great holiday. This website has a few reviews on the Elenite Villas from this year and in my opinion are closer to the experience our party had last year. Worth a look and hopefully they will ease any worries you might have after reading some of the reviews on this site. There were comments like the one just posted before we went to Elenite last year and we were worried, but decided to go ahead with the holiday. We all had a fantastic time, but especially the 4 kids who were in the group who were on the go from morning til night with all that the resort has to offer, with the pools, fantastic beach and brilliant waterpark, which is a major bonus. Yes the food was not brilliant, but we didn't starve and enjoyed it most days out of the 14 we were there and the kids never complained. The entertainment staff were great and worked really hard. I'll be amazed if the place has changed to such an extent from July last year. We go in just over 2 weeks and I can't wait. You get what you pay for at the end of the day and I thought it was outstanding value for money. was it really that bad. sholud i speak to my travel agent as we go in a few weeks time. it sounds like the rooms were very bad and not safe. any plus points at all. i enjoyed the holiday as i was with alot of my family withouth them it would have been unbearable. The local people i.e the russians ruin the place with their arrogance and lack of manners. As i am not one to let people barge thier way about i found it very hard to keep my mouth closed but had to as we were by far the minority. well i am home and have never been sooo happy to come home from hoiday. The resort is lovely and very well laid out, very clean and nice to walk around. The food in the main restaraunt is very basic...if you don't like chicken or pork then like me you can live on mixed veg...i reccoment the Sozopol restaraunt. The place is over run by arrogant Russians who just barge their way about into queues....they even killed a dolphin on the beach. the entertainment hall is only open every second night and inbetween the entertainment moves to the beach bar at which drink is payable here. if you are looking to do a day trip i would definitely reccomend Nessebar, it is lovely and is nice to walk around with lots to see and plenty places to eat. any way not wanting to write war and peace so will leave it at that. oh just a quick note...watch out for the security staff, a scottish woamn was beaten badly by them, anothe guy from london was cuffed and held overnight for being too drunk. Yes the beer is included in the all inclusive. It's decent stuff as well. In the "ice cream" bar, lobby bar (on a night) and the restaraunt it's served in proper glasses, but for obvious reasons around the pools, on the beach and in the show lounge it's in plastic glasses. As long as you are not expecting 5* luxury I can assure you you'll have a good time, kids especially have enough to keep them entertained morning 'til night. We were there last year, we'll be there in 4 weeks time and have booked for next year and we have never been to the same place twice other than to Elenite Villas. We are travelling with balkan and really looking forward to it. Had a bit of a mare typing that last comment!! Anyway any info would be much appreciated. We were at Elenite Holiday Village last year and had a fantastic holiday and me, my wife and 2 sons aged 8 and 4 are going again on 1st August flying from newcastle. My question from anyone who has been this year is, has there been a 2nd pool build built for the villas? I've been on the Balkan website and it looks like there is a pool between the Royal Park and the one at the "ice cream bar". Can anyone confirm? and if there is, does it have it's own bar, does it serve snacks? Also it looked like new slides were being added to the waterpark when we were there last year, have any more opened? The newest last year was the black hole ride. If you are a family with young kids travelling to Elenite I hope you enjoy it as much as we did last year. Fantastic place wih loads to do. Sorry forgot to say that inflatables are allowed in all the pools. These are available in all the little supermarkets in the resort! The waterpark is excellent...something for everyone. It is only 3 minutes walk from th villas. What is the water park like, what is it called and how far away is it from the villas. In the pool is there any inflatables, toys water guns ect. What a lot of questions....I will try to answer as many as I can. Sports: - At the villas there is a daily aerobics session in the pool and waterpolo. On the beach there are organised beach volleyball games. At the centre of the resort is the animation hall with a large notice board. This shows you exactly what is going on when...sports and shows. There is always football being played on the beach in the evening.....just a bunch of kids playing! There is mini golf available and tennis courts but you need to pay to play ....don't know how much! There is a show in the animation hall every evening at around 8ish....have been to a few and they are very good. Icecream: At the bar by the villas pool is where you can get ice cream....they are lovely and lots of different flavours such as vanilla, choc, strawberry, mint, apple, parma violet!, coffee, caramal. Not all the flavours are available everyday but there is always a good selection. Food: The food is fine and tasty if you are willing to try things that don't look like what you are used to at home. There is always salad available and a variety of hots dishes...rest assured you will not starve! sorry i put netball twice the last one was ment to be basket ball!!!! i also love swimming and the water park sounds great! !i have been in wave pools in florida and they were great so hopefully this is just as good!!! and netball( i told u i love sport! thanks for all the help probably will go thank you so much. i hope i dop love it by!!!!!! Paige, please do not worry ..I am sure you will have a fab time. We normally travel with Balkan and they have a kids club but to be honest my children have never been that keen as they make too many friends by the pool and on the beach. The water park is great....childrens pool with smaller fun slides, a large pool for swimming in, large water slides (3 togther and 2 curly bumpy ones) New last year was a black hole type shoot where you drop out into a small pool, a slides where you go in a inflatable ring and hopefully a completed wave pool! Food is not english....but I am sure you will find something to eat most days....my children only really eat chicken or fish and that was available with either pasta or chips. Food is definately an area where they could improve but I can imagine this being a very hard task for the hotel as they have so many different nationalities to please. You are in a different country so be adventurous and try something new...you never know you may love it!!!! Please do not worry about the reviews....you may well notice that most of the negative reviews are from those staying in the hotels at either end of the resort not in the villas. Have a lovely holiday and do not worry....we are going back for the 4th time simply because my children love it so much! do not worry just go and enjoy yourself. have fun,has bad reviews in the past stopped you from haveing a good time. we are going in 3 weks time and i would like to ask if you can change money at the hotel as i have heard that you can only do this at the banks? Came back on Sat 20th from Villas & already looking in2 booking next year it was amazin,we always go to Greece & been to Kos for the last 8 yrs but pleased we changed our mind this yr & from now on.It is soooo clean never seen as many cleaners anywhere b4,our room was right beside the beach twin with bunk beds no hairdryer,mam & dads rm nxt villa they had a hairdryer so depends,there is no dress code for the restaurant,food was a bit of a downer sometimes not hot but there was a number of complaints so it may change they had microwaves(3)but the last 1 broke last week you need them to heat the food up plenty to choose from we always found something we liked,but no good if you are a very fussy eater,not much actual kids choices.Sometimes not enough tables either,a number of staff were very nice but some were really miserable looked like they didn't want to be there.Weather fantastic, animation team amazin plenty of activities to do for kids, teenagers & adults.We all felt very safe here also. Hi Sarah, There's only 12 of us going from Glasgow on Monday 29th, but it's 4 adults and 8 very noisy children, so you won't be on your own with the noise thing. I'm sure it's all part of the fun. It is our first time going to Elenite as well, and I'm sure it will be great. I'll listen out for a noisy big group from Edinburgh when we're there and say hello. Apologies to everyone else who will be there at the same time as us(you may need earplugs). we are heading out on friday and there is a family in our party with a baby and they have been told to take thier own travel cot, but i think it depends on what size of appartment you have? hi all just back from elenite and loved it dont know what all the bad reports were all about , ok the food isnt the best but we always food somthing eat and thats hard with 5 and 9 year old kids. staff were pleasent and tried there best to help . water park great for the kids you have to pay for the beds i heard a few people complaine about this but if your going all day then its not much. some people just brought there towels and left them on chairs at the bar. hope everybody has a good holiday . Got my ticket leave Tuesday,have just checked weather it to be crap raining for the first few days. Whats there to do if there's no sun. Feeling really down. Just my luck it will rain most of the holiday. Hi - There are no hair dryers in the rooms (or there haven't been in any of mine) There is an ATM (installed last year) just outside the reception area for the villas.....I have'nt used it so I have no idea if it is well stocked up. Is there any cash machines locally, or can you use visa in the local restaurants etc.? Pleased you had a fab holiday.....I agree with all your comments....can't wait to go again in August! Hello everybody, i have just got back from Elenite, Bulgaria with my Girlfriend and her 2 Five year olds and just wanna say what a lovely place Elenite was. Cant believe it was the same place to what all the bad reviews refered to. The place is VERY clean (there was 6 people cleaning a pool at one time) always people cleaning all day long. Our lady who cleaned and washed pur floors in our room and even tidyed up our mess(kids clothes everywhere) was Brilliant. The beach was gorgeous, which we thought that the pictures you get online do the beach and resort no favours at all. The whole Village was Lovely. People on here was also saying that the people were not polite or rude - which by the way is so far from the truth. always willing to help with a smile on there face. Would definately reccommend this Place to stay to anyone who wants to take Children or want a nice relaxing Holiday - Elenite is for you, if you like the Hustle and bustle or clubbing, bars etc i would pick Sunny beach, which for us 4 was too busy and busy with Hotels everywhere. The only little negative comment about Elenite is that the food was Ok- not brilliant, or bad just ok. But all in all the 4 of us had such a Brilliant time that we are looking at booking it for next year and the only place in Bulgaria that we would return to is Elenite - i would honestly rate this holiday on the whole at a 9/10 - Superb!! Hiya going to the villas on 6th June with my Husband,13yr old son + mam & dad really looking forward to it been to some really good places & bad a holiday is what you make of it.This is our 1st time in Bulgaria & 1st time All Inclusive. any1 else going the same time we are flying from Newcastle. Going to Elenite for fist time in 4weeks tomorrow. Have heard loads about it good & bad, going to go and hope for the best. I have a 11year old girl and would like to know if there will be lots for her to do? We went here last Aug 08 and had a fabulous time. I would have loved to go back but couldnt justify the increase in price compared to what we paid last year from belfast. Only thing in august was the wasps I coped with them ok but for my 11 year old if you ask her about bulgaria she always comments on the wasps - though she is a drama queen. I think value for money this resort is excellent and I would have loved to go back this year. I will try and answer all your querries. Weather in July is warm dry heat (no humidity)The sun is very strong so if you suffer from prickly heat make sure you take some piriton or such as there is no chemist on site in case. I would recommend that you do this with any medication you may need ie paracetamol, sting relief (wasps are around but we have never been stung), plasters, antiseptic cream etc... better to be prepared then having to go to Sunny beach in a taxi! With regards to pool....the sun loungers seem to fill up in the morning (no need to put out towels) and then empty again after lunch....I guess this is because people go to the pool first and then the beach after lunch. Both are lovely so I would just alternate. Your son will probably prefer the waterpark but if you want to sit there they charge 5 lev for a sun bed and you pay for your drinks! The villas are fine.....basic. OUrs have aways been clean. The cleaners are lovely and work really hard..If you give them a small tip (a few lev) in the first couple of days you will find that they will look after you very well....same goes for the bar staff in the coffee shop! The missing towels was something that happened in one of the hotels last year not in the villas so I would not worry about it. I would advise though to take beach towels and not use your room towels for by the pool. With regards to car hire...I have always been advised not to hire a car as they drive like maniacs and if you have an accident or the car is damaged you are always blamed as you are the tourist. Overall we find this holiday very relaxing....it is a quiet resort and very family orientated. I have always felt safe here and really enjoy the low key evening entertainment. We prefer to make the most of the day with the children and then finish off with a quiet drink before bed! I hope you enjoy it and I would love to hear your thoughts when you get back! This resort always received really mixed reviews....you either love it or hate it. Going in May is very early in the season so I don't know what it will be like weather wise....I imagine it will be fairly cool in the evenings and lovely during the day. Hi, My girlfriend, 2 five year olds and myself are going to Elenite in 3 weeks today and cannot wait but i am hearing alot of bad feedback on various web sites!! People saying the food is rubbish, people are un friendly etc. just wanted to know what the view was from a whole who have been? Also would like to know what the weather is like? heard that there is loads of wasps here, is it as bad as i have read? This is my first time going to Elenite. I have a 11year old & 2 Year old both girls. Just wondering if the 11 year old will have fun as there is no kids club with the villas. Just booked it last week for the end of June. The cost of the holiday has remained pretty much the same for 2aduts and 2 children. The cost of things from the shop has increased and also we noticed last year that there was a considerable increase in cost of drinks when we went to Nessebar. thanks for getting back to me. i was just a bit worried. i take it you love it then 4th time. the last time we went was 3 year ago butwe stayed at nessebar and loved it , but now they have made the rooms smaller so they dont have family of 4 rooms anymore so we thought we would try elenite. has the prices changed alot in the 4 years you have been going. when we were their it was very cheap to eat and drink out . thanks again for your info . We went there last year and stayed in the village. The villa was a bit old - I was told villas were build by Swedes abt 20 years ago, but our one was just by the beach so it was fantastic for us - we have 2kids who were 3 and 5 last year. This year we booked Royal Park as could not get a villa on our dates. Aquapark was also a good extra. This year we also want to see Shipka - my distant relative was fighting Turks there in 19th century. Hi..you can use you band in any of the bars within the villa complex...this consists of a coffee shop/bar, reception bar and the beach bar shaped like a ship. There is another very large beach side bar that is payable to everyone. The beach is fantastic...loads os space and very safe. There are lifeguards all along the beach who really do watch out and are not afraid to use their whistle if they feel you are heading into danger. We love this resort....I am not saying it is perfect but the facilities are excellent value for money. hence us going back for the 4th time. If there is anything else you wish to know just ask. We are going back again this year (4th time!!! ).....was tempted to find somewhere else but really struggled to find something that had the same available at such a low price! My children love it here...the waterpark is such a bonus! I know the one you mean..they have used the same song for a number of years but I have never managed to find out who it is by! My girls loved it as well....hope you find out! yeah meet up for a drink my daughter is 10 Kayleigh and my son is 12 Jack. Shaz will meet up for a drink. Safety deposit boxes - there is no deposit , you just hand back the key when you check out. There is no childrens entertainment around the pool for the villas....This seems to happen around the pool at the Royal Park going by the loud shouting of 'oggy oggy!!' as I walked past on the way to the water park. The villas pool is used for water aerobics at 3pm followed by water polo. There are various kids clubs depending who you have travelled with. First Choice seem to be based more at the Royal Park and they hold a kids disco at 8pm in the ampitheatre (near water park and mini golf. For boys there seems to be a permanent game of football on the beach which anyone can join in. Hope I have answered all your questions! Don't worry about asking. There are safety deposit boxes it cost about 100 lev for the 2 weeks. The hotels have a little bit more freedom with regards to using the pools but thats all.....each hotel can use their own pool and that belonging to the villas but not each others. Those that I spoke to felt that the villas had the best main restaurant with regards to choice. Personally, I have always prefered the villas as I don't like being in a multi storied building particularly with regards to the balcony and children! I also feel that the noise will be higher in the hotels with doors slamming in the corridors. The villas have its own pool....a large rectangular one next to the coffee shop and near the ice creams!. The pools at the hotels look nice but I know that the one at the Royal Park gets very buisy (people struggling to get a lounger) and also noisy....its where first choice do constant entertainment such as bingo and silly games...not my thing ....I prefer peace and quiet without the fear of being thrown into the pool!!!!! Sorry being a nuisance now, what about safety deposit box are they available and how much are they?? I take it the villas have their own pool if we are not allowed to use the hotel pools, maybe I should have booked the hotel instead of the villas sounds like they are allowed more freedom???? The villas all have a small fridge which will be stocked with 2 bottles of water and a choclate bar! Rooms are an adequate size andhave either bath with overhead shower attachement or a proper shower cubicle. For those staying in the villas free drinks are available in the coffee shop and bar in reception, bar in animation hall and nightclub. Villas are not able to use the main pools of the Royal Bay or Royal Park and are not able to use their bars. (They however can use the Villas!) There is a large beach/cocktail bar which is payable to everyone. Entrance to the waterpark is free - if you need a sunbed they are 5 lev per day and the bar is payable in the waterpark. I have mentioned in previous posts that the electricity can sometimes be a bit erractic (we had 2 power cuts this time during the afternoon for about 2 hours)...this did not effect us at all but it was a little dark going to the toilets as they have no windows....suggest taking a small torch just in case. When we there last week there were quite a few wasps around...they did not sting any of us but I carried sting relief with me just in case. This resort seems to always receive really mixed reviews...I think you either love it or hate it. I love it here as I have 2 young children who only want to swim all day....the beach is lovely with plenty of sun loungers. The waterpark is a great feature for a couple of hours. I also like the fact that everything seems to be relatively quiet at 10.30pm and you can enjoy a drink on the balcony and listen to the lapping of the sea! Hope this helps ...if you can think of anything else you need to know...just post a comment! Hello....we have just returned from a third visit to Elenite and can honestly say that each time we go it just gets better. The Villas are spacious and clean....we were very lucky and had one right at the front by the sea. The food improves each year...there is much more variety suitable for children, fresh pancakes each morning. Snacks are more widely available..hot dogs from beach bar, toasted sandwiches (from about 11.30am to 1.30pm) at the coffee shop, chicken kebabs available from the roof terrace at reception level (would recommend these!) and pizza from the BBQ restaurant near the Royal park. The weather at the moment is great....not humid but very warm. We had a few cloudy days but still warm enough to swim or make sandcastles! If anyone has any questions I am happy to answer them. only one more week must start packing. Going soon and hope the weather cleans up over there:). well 3 cause wont be sleeping well on the 3rd night. hi,going on the 28th july 2008...4 sleeps...cant wait,trying to ignore negative comments! do i need to take towels if staying at the villas or ar they included? Went here a couple of yrs ago and it was one of the best holidays ever! thank you for the reply Shaz. I just needed to know because I have to refridgerate my medication and our travel agent wasn't certain. We fly from Durham Tees Valley. Only 21 sleeps now!!!! Hi everyone. I'm going to Elenite on 11th August (9 of us in total) and if people who have been before can tell me if there is a fridge in the villas? I can't wait. Hi Dave, Thanks for that. It's the appartments we are going to and the rooms on the Website look nice enough indeed. We've just heard that my Mother in law's friend was at the resort earlier this year with her husband and Grandson, and she has just booked for a familly group of 9 to go next year, so it has her seal of approval too. Enjoy your holiday when it comes. hi louise we have stayed in the holiday village so i cant comment on the rooms in the hotels but they seem quite good from walking round the shopping center under one of them. the village rooms are basic but they are adequate for your needs bed etc ample storage the pictures on the site are a true representation of the complex. anyway not long off now 11th aug hope you all have a good time!!!!! Hi Michelle, thanks for the info on the mozzies. I normally go with repellant anyway, just got a bit concerned when I read a comment on another site which said they were really bad. Also since you have been before can you tel me what the rooms are like. I have seen images on Balkan holidays website which looks a bit run down when compared to the interior shown on the Victoria group website mentioned by Dave on 25 May 2008. We will be going anyway, but dont want to have unrealistic expectations before we go. Not that we intend spending that much ime in our rooms anyway. Any information from anyone who has been would be much appreciated. Hi...We have had the odd bite but I don't think they are a major problem. Hi there can anyone who has been before let me know whether or not mosquitos are a problem here. Thanks. well to all the people who jave slated the elenites first let me say you must be barkingmad. i first was dragged to the resort kicking and screaming by my wife three years ago after she went on her own the previous year. the food was nice the locals and staff will bend over backwards to help you! the animation team go well beyond the call of duty making sure you enjoy your holiday. as a result we have made this resort a second home. if you like hustle and bustle go to spain but if you want a holiday were you can look back and say well that was great then this place is for you. its only 10 mins away from sunny (blackpool) beach. and only 5 mins walk from an equetrian center just outside the complex. to sign off you can never please everyone all of the time but at least at this resort the locals will try!!!! Trish...I fully understand your situation.,....it is worrying enough taking children abroad who have no medical conditions. I agree you are better going to a country with a better infrstructure such as Cyprus...I would do the same! The first time I went I was like everyoine else reading all the comments and worrying - luckily we had a fantastic time! If you notice though most of the negative comments are from those who stayed at the Royal Park which personally would be my idea of hell as I don't do high rise hotels!!! I prefer to have my feet nearer the ground. If anyone has any questions I am more than happy to help! Hi Guys I wasn't being fussy, even he head o ftourism in Bulgaria is worried that they can't cope this year with the amount of visitors arriving. I have 3 sons with a medical condition and they need intravenous injections, i can't really do that with no power, there was a 3 da power cut last week which ended up in everything closing - Bulgaria are currently selling 60% of their power to other countries and can only cope with 15,000 tourists not 40,000 blasting air con. Cosmos were totally understanding, I have been to cyprus before and know of nearest hospitals etc, my problem was I shouldn't of booked a holiday in eastern europe with the boys condition. Im sure everyone will have a wonderful time and I think the resort looks lovely, maybe in a few years when the infastructure is sorted we will head to Bulgaria. Have a great holiday everyone. It is a shame that Trish felt she had to change her holiday. Everyone is entitled to their own opinion and everyone's expereiences are different. I can imagine that if you are unfortunate to fall ill on holiday that it can put you off that destination....but it can happen anywhere in the world. The best is to take precautions. I would advise to take a torch as power cuts do happen....I have had one each time I have been lasting a couple of hours...it by no way affected my holiday...just a bit dark going to the toilet!. The first time I did not have a torch but the next time I took two wind up torches and a couple of tea lights just in case! It is worth noting that the nearest pharmacy is in Sunny Beach so it is worth while taking a few things with you. I found last year that ibrofen, piriton (in case of heat rash! ), calpol, dyrolyte, immodium, plasters, antiseptic useful. Another useful tip that I read in a magazine is to take pro-biotic (actimel type) for a few weeks before travelling as this helps against holiday tummy (new place, new food etc...) and we all found that this helped. We have been twice and had a brilliant time and are going again on the 20th July....Can't wait!!!!! Hi Everyone - well ive had 2 phone calls today from family regarding an article in the Telegraph about the infastructure of Bulgaria, the power cuts, the sewage problem...so im afraid i have bottled it and rang cosmos they told me to find another holiday and they would move my money to the new holiday...i struggled to find somewhere for 5 of us, but we eventually got Cyprus...so i feel a lot more chilled out now...I hope everyone has a lovely time in Bulgaria and that all the stories aren't true. Hi Denise....I will try to answer a few of your questions. If you are staying the the villas you are not allowed to use the facilities at any of the hotels....however there is a lovely swimming pool with a bar/coffee shop. At the centre of the village (near the main restaurant for the Villas) there is a small supermarket selling chocolate,crisps, sweets cigarettes, spirits, toiletries etc.... There is also similare supermarkets by the reception for the villas and in the other hotels. Nessebar is lovely to visit....the buildings are very old and lots of shops selling souveniers. It is nice for a day out and easily got to by boat or by mini bus. We always went by bus as sometimes the boat had trouble docking if the sea was a bit rough and would have to turn back! Can't advise you much about Sunny Beach as we only went once and hated it! It is really buisy and the shops selling lots of rubbish! After the relaxing atmosphere of Elenite we could not keep up with the pace of life!!! The waterpark is free to use but if you want a sunbed or parasol then you will need to pay 5levs each. You also need to pay for your drinks. As my children are quite young we only went for an hour a day so it never really bothered us! I find it a shame that people can be so negative about Elenite. I have been there with my family for the last 2 years and both times we have had a fantastic time....so good in fact that we are going again this year. Unadveturess I know but with 2 small children who are only intersted in swimming and making sandcastles there is no point in paying a fortune to go anywhere else when Elenite meets all our needs at such a reasonable price! If anyone has any questions I am more than happy to help! Hi Dennise, that has put my mind at rest a bit, did you have a walk around the village? I am keen to know if there are any shops on the village to by alcohol and ciggies and for the lads to buy sweets and stuff.? I don't know how much Lev to take, we are there for 2 weeks, 5 of us, would we spend much. Did you go on any trips, we are keen to head to Nessebar ive heard its supposed to be lovely. Are the guest from the village allowed to use the waterpark and facilites at the Royal Park? Sorry to bombard you with questions but i think a few of us on this site are wanting as much info as possilbe. Hi, me my husband plus two children are going on the 11th August, little bit worried about the previous comment because have not heard anything like that ( e-coli and the food) Looked at thr trip advisor web site and had heard nothing there. We are going to elenite august this year with our 10yr old daughter. When do you go? We are there 1st 2 weeks, we might see you there lol. Ive been the same as yourself pretty nervous after reading some reviews. We're off to The Elenite Village at the end of the month - anyone know what we should pack - not sure what the temp. is at this time of year and is this place as bad as many have reported? hello my name is ruth, and i am writing to find out what Eleni,hotel is like. could someone please tell me what the food, entertainment,staff and the rooms are like . my family and i are going in 3 days. my son went to the bulgarian animation team and i could not fault them atall, british reps i can't comment on except for the lively crowd at the pool tables playing killer pool, very noisy, but older kids. the girls in the animation team (bulgarian) also do the shows at night. we have just returned from 2 weeks at elenite holiday village and could not have asked for a better holiday, in fact we have already booked to return next year. don't bother with the reports that say this place is dreadful, the food was great always something 2 eat chicken, beef, pork, 2 soups every day, salads, cakes seperate childrens buffet. the entertainment is in the amination hall situated on the front, starts at 8am with kids disco, bingo at 9 and shows at 9.30pm all the shows were fantastic. there is a kids club from 10am till 12 noon and then again from 3pm till 5pm and the girls that run the club are fantastic with the kids. the place is spotless always being cleaned, the staff are great (with the exception of the reception staff whom i found a litle stuffy). i would recommend this place for families but not for couples. there is a disco on site which is open till 4am. snacks are available all day on the beach front from pizzas, chicken kebabs and hot dogs, there is also ice cream nad biscuits at the pool bar. Yep! There are taxis 24/7. But there so many things to do in Eenite ! Waterpark, nice beach bar, night club etc., etc.Why should somone go to Sunny Beach ?!!! HI!! im goin 2 the Elenite Holiday Village in august wit my boyfriend and was wondering are there taxis or transport available to go to sunny beach at night for clubbing etc?? hi all can any one tell me if the Irish bar is part off the all inclusive ?????. shopping is good loads of good copys and cheap, nessebar is worth a visit dont go to varna its not worth it its all travel and not much time to see ne thing. in sunnybeach there's a mcdonalds if ur kids r like my lil girl and loads of nice restaurants with pizza, kebabs etc. all of which r very cheap. shops and sight seeing meanly all so good place`s for food,i am takeing to kids 14 and 12 did you go on the water park?? sam. the weather was great about 26c-28c tho can be a lil cool at nite. what type of places are u looking for ie. clubs,shops or sight seeing?? hi there lisa im going to the royal park this june wot wos the weather like that time of year? ?,and can you tell me any good place`s to go to, thanx for your time . i was staying in the royal park last summer and im going back in june we had a great time and thanx to u and the other staff are the hotel was always clean and staff were always busy and hard working. we are going to elenite on 2nd july 2007 for 2 weeks, husband, myself and 5 eyar old son, is the water park any good for someone his age, if so how much does it cost for a day. i have also read good and bad reporst about elenites but we will play it by ear as this happens all the time i book a holiday i read the reports and then the place is no where near as bad as i am expecting. We had a great time. All we wanted was a two chill out and that is what we got. We could not fault the hotel, the accomodation was superb, absolutely spotless, the food could have been better, but we allways found something we liked. I have never seen such a clean hotel, there were cleaners everywhere, the beach was constantly cleaned. You have to remember that this is a First Choice hotel and the reps worked their butts off. The evening entertainment at the Royal Park was to a very high standard (if you discount the evening Bingo session. If you have kids they will love it. we did not go to the 'Annimation Hall', we found other entetainment at Paco's bar the wooden shack behind the hotel. I have no hesitation in recommending this hotel to anyone, you get what you pay for. it is the best hotel that i had nerver known. It is a perfect hotel. it has only 3 strars but it must have 5* stars. Stefanie : I love you and i meet her there. elenite is a lovely place to stay if you want a beach holiday. nothing much to get dressed up for at night unless you get a taxi into sunnybeach where there is more entertainment going on. we found it very clean and friendly but we would not go back as it has nothing in the complex for our family in the evenings. weather great, beach great, pools great, food not so good and entertainment crap?. a must see is nesebar good food,& shopping, and if you are a family of 4 you are cheaper going by taxi only 60 levs were is the boat is 80 levs and shops you can hagil with and get your stuff for good prices. so thats what we though of elenite holiday village. We returned from Elenite Village yesterday. The whole place was so clean, staff very frinedly, a whole range of food. Wonderful views all around us. the village is a great place to have a relaxing holiday. the beach is gorgeous,the food and drink were great!the pool was always clean as was the entire village - always cleaners seen throughout the day ad night cleaning. Sunnybeach is only about 15 mins away and def worth going there for a more lively athmosphere. The village has been complained about and i dont realy see why. Loved bulgaria and will def go back one day! Arrived back from Elenite Holiday Village on 21st May 05 with a nice tan. Me (21) and my boyfriend (26) were worried about all the bad reviews we had read before going out there, but we shouldn't have worried because it was really good. The only complaints we did have were that when we first arrived at about 2am there was not enough bell boys to take people to their villas. In the end we all just went and found our own rooms. The food was sometimes cold but it was always cooked, I think it was more to do with if you went down to eat late. We ate in the Talyana restaurant and the Sunshine restaurant, so there's plenty of food to choose from. The pool's are really cold, so you have to be brave when you get in. We went on the Lazy Day Cruise which was really good, just a bit windy. You sail round the coast going to Sunny Beach and Nessabar, and they put on a really nice lunch for you. The entertainment is good as well, something for all ages. Take advantage of the coach service that the hotel offers, it costs 8 levs each for a return. It's loads cheaper than a taxi! The maids are always cleaning at all hours in the day. We had a really nice villa right on the beach, so we were really lucky. We probably wouldn't go back again only beause it's more family orientated, and there's nothing to do after midnight unless you go the 30 mins into Sunny Beach. Highly recommend it to anyone thinking of going, great value for money.